Last post, I went through the logic that suggests that teams should wind up paying the same amount per win, regardless of whether it's a big-market (rich) or small-market (poor) team. That method started off with a guess at how a team's revenue increases with its wins. That was "Table 1" in the previous post. The actual numbers I used in the post, however, were not realistic for baseball. They assumed that each win increases a team's revenue -- which *is* reasonable -- but that the increase drops the more wins a team achieves. So even though the team will make more money when it wins 85 games than when it wins 67, the 86th win is worth less than the 68th win. That simplification was to make the explanation easier (and that explanation is correct, even though the revenue curve is unrealistic). This post, I'm going to try to fix the revenue curve somewhat, and argue for what a team's "real" curve might look like. As I said, the model I used, which assumes each additional win is worth less than each previous win, obviously doesn't hold. And the most obvious reason for that is the post-season. Around 85 wins is where a team sees its playoff chances take a big leap forward, and that's where fan interest increases accordingly. Beyond about 100 wins, though, it would seem reasonable to assume that wins aren't worth that much. 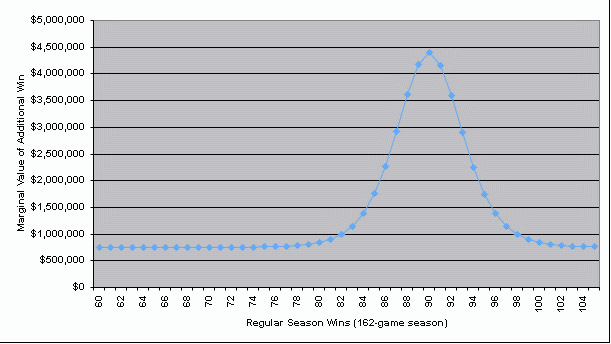 You wouldn't expect a team to make a lot more money when it wins 110 games than when it wins only 105 games. Because, after all, you might assume that at 105 wins, fans are as much into the team as they're going to be, and the extra five wins at that point aren't really going to change how the fans perceive the season to be going (very, very well). There are two quick adjustments we need to make to this chart. First, there's inflation to consider, since Silver created his graph before the 2006 season. I'm just going to bump all the dollar values up a bit. 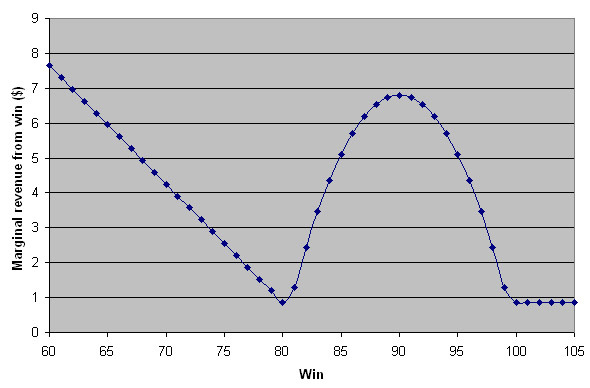 Second, and more importantly, Silver's graph tells us how much an *actual* win is worth. But, before the season starts, a team can't know how many wins it will achieve with that kind of precision. Even if it's perfectly omniscient about how much *talent* its team has, there's still a standard deviation of about 6 wins between talent and achievement. A team that's created to be perfectly average in every respect should go 81-81 -- but, just by random chance, it will win fewer than 75 games about one time in six, and it'll win more than 87 games one time in six. And so, we have to adjust Silver's graph so that the hump is wider and shorter, in keeping with the reality that luck causes wins to be more widely dispersed. I'll make those changes later, because, first, I want to explain that there's still one big problem with this chart: in economic terms, it doesn't make sense. It doesn't lead to teams acting in ways that we actually observe in the real world. That doesn't mean that Silver is wrong -- it could be that teams just don't try to maximize profits as I think they do. But, as I'll argue, one change to the graph might make it work out. First, let me explain what doesn't make sense. Suppose a team has 60 wins. Looking over at Nate's chart, the 61st win (to an average team) is worth another $750,000. Now, we know from real life that a single win costs more on the free-agent market than that, even after adjusting for inflation. So a team that buys enough wins to get to exactly 61 wins will make less money (or lose more) than a team that stops at 60 wins. If we assume a win costs $2 million or so (in Silver's 2005 dollars), then the same is true for the 62nd win, the 63rd, win, and all the way up to about 85 wins -- the win costs more than the revenue it generates. So no team should aim for finishing with between 61 and 85 wins. If they did, they could always have made more profit by, instead, aiming for only 60 wins and saving their free-agent dollars. What about 86? Well, the 86th win costs the same as the 85th win, but results in more marginal revenue than the 85th win ($2.2 million for the 86th win, compared to $1.8 million for the 85th win, according to the graph). So number 86 is always a better bargain than number 85. So if a team is willing to buy win 85, it should also be willing to buy win 86. What about 87? Same argument: the 87th costs the same as the 86th, but is worth more. And so on, up to the peak of 90 wins. Now, the 91st win is worth less than the 90th win, at a bit over $4 million, but still only costs $2 million. So the average team should keep buying. The 92nd, 93rd, and 94th wins are also worth more than their cost of $2 million. But, the 95th win costs $2 million, but returns only about $1.7 million, so the team will stop buying there. But, wait! We can repeat the logic for a smaller-market team. We don't have Silver's curve for that smaller market team, but we can guess that although the curve won't be as high, but it will probably be the same shape. And, therefore, the same logic should convince you that the breakeven point for the small-market team has to be somewhere between 90 wins and 95 wins. Just go through exactly the same logic. The 61st win is still a money-loser for the small-market team -- it costs $2 million but earns it less than $750,000. The same for the 62nd win, 63rd, and so on. 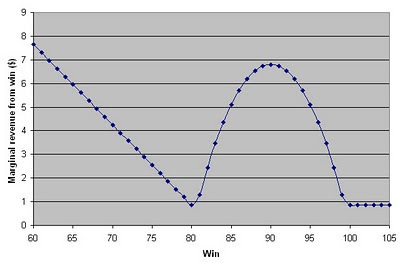 Furthermore, from the shape of the curve, we can tell that if a win becomes profitable anywhere between 61 and 90, it is profitable all the way up to 90. So if the team is willing to buy the 61st win, it has to be willing to buy all wins up to 90. So, in summary, every team in MLB should either stop before 60 wins, or buy at least 90 wins. Does that happen? I don't think it does. If it did, you'd see a two-humped distribution of actual wins in the major leagues: one group around 60 or less, and another in the low 90s. I don't think that's the case. I think you see a lot of teams in the mid-to-high 60s and 70s. I think what's missing from Silver's graph is what I suggested in the previous post: that the first few wins are very valuable, because they convince the fans and the world that the team is a reasonable contender. They keep the fans' faith. Nate Silver has the 61st win worth only $750,000. I think it's worth more than that. I think that if you were to stop buying players when you got to 60-102, you'd be a laughingstock. There would be calls for salary floors and cancelling of revenue sharing and other rule changes. Even the big-market teams would complain -- it reflects badly on the Yankees credibility when it gets to 100 wins by beating up on teams who don't care about signing players. You can quibble about lots of things here ... maybe the straight line on the left needs to be curved, and maybe the hump needs to be a little taller or shorter or less steep. And the dip at 80, maybe you could argue that should be at 77 or so. But just concentrate on the basic shape. What does it make sense for the average team to do now? Well, suppose wins cost $4 million. Now, it's obvious the team should buy all the wins from 60 to 70. They're all above the $4 million mark -- some of them far above the $4 million mark -- so they're profitable. But the 71st win costs $4 million, and returns only about $3.9 million. So there's an argument to be made that the team can logically stop at 70 wins. So the logic is that maybe the team should stop at 70 wins, or maybe it should keep going all the way to 96 wins. 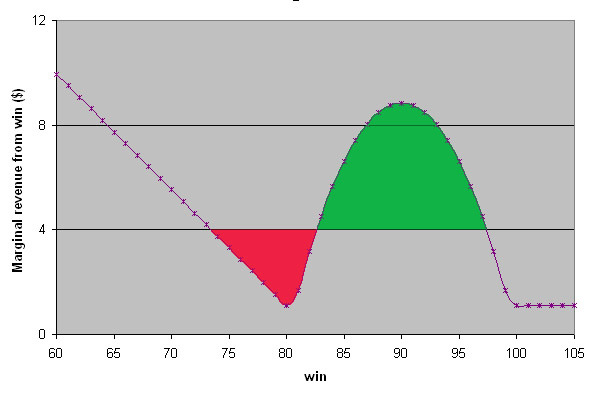 If the team buys wins 71 to 96, the first 13 or so wins give it a loss, the red area. The next 15 wins give it a profit, the green area. Which is bigger? You can do the math to find out, but, to me, they look about the same. And so the team should be reasonably indifferent to which strategy it chooses. The loss from 66 to 85 is huge, much bigger than the subsequent maximum profit from 85 to 95. So, obviously, this team will stop at 66 wins. This is like the Yankees ... it'll obviously buy wins all the way to 96, every year. The green area is obviously much bigger than the red area. So that's my theory, that wins are valuable when you're very low in the standings, and that's what drives small-market teams to at least try to buy *some* wins, rather than lose 110 games every year. Those teams should finish low in wins. Average teams might sometimes find it most profitable to stop in the 70s, and sometimes find it most profitable to try to win 90 or more. And large-market teams should be shooting for 90+ wins every year. If this theory is roughly correct, what should be observe? 1. High-revenue teams buy lots of wins, low-revenue teams buy few wins. 2. There will be teams who buy low numbers of wins, teams that buy medium-low numbers of wins, and teams that buy high numbers of wins. There should be no teams who try to buy between 81 and 89 wins, because, no matter what your team, 90 wins is always more profitable than anything in the 80s. 3. Notwithstanding that, the curve is close horizontal around 90, so teams might decide to by 87 wins instead of 93 because it requires less investment and produces not that much more profit (look at 87-92 on the Yankee curve -- you could shave that off the green area and barely even notice). 4. 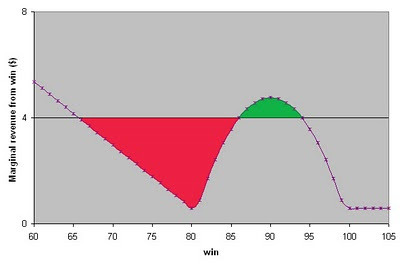 Because, for many teams, both 70 and 90 wins are almost the same in terms of profit, some teams might find it advantageous to switch from being a bad 70 win team to an excellent 90 win team, and vice-versa. 5. 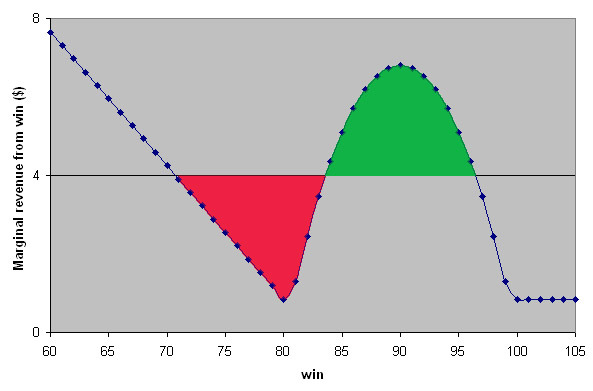 Hardly any teams should find it most profitable to aim to lose 100 games or more, or to win 100 games or more. I think all these are roughly consistent with what actually happens in MLB. The biggest discrepancy is that for #2 and #3, Bill James once observed that if you plot a graph of actual wins, the peak is not at 81-81, as you might expect, but, rather, at 83 or 84 wins. That's the area where we expect teams NOT to live. But, that Bill James study was 25 years ago, and salaries were much smaller then, compared to revenues, so things might have changed since then. So in order to get everything to work out better, you want to ask: what does the curve *actually* look like? I'm sure that if you did some math, or just trial and error, you might be able to come up with a curve that would better match reality than what I've done here. In any case, it seems to me that this is roughly the right answer for what goes on in real life. But I might be wrong -- as always, let me know if my logic is missing something. What about the Picasso value of a win? That is, the intrinsic non-monetary value of winning? Also, I wonder if there is a championship-discount. If the Blue Jays and Yankees each offer $15M/yr to a free agent, which team would he likely sign with? So how much more would the Jays need to offer to induce him to sacrifice the opportunity for a championship and all the other benefits of playing in NY? I'll have to think a bit about how a picasso-motivated owner might affect the price of free agent wins. Probably not that much, is my gut, but I suppose you'd (I'd) have to set up a model and do some calculations. Also, I suspect the championship discount isn't that big a deal. If some free agents won't sign with the Blue Jays for $4 million a win, there are others who will, so it shouldn't be a big deal, if it's a minority of free agents who feel that way. It's like, if I prefer to do my computer programming for a company that's in the top half in corporate responsibility, I shouldn't necessarily have to take much of a pay cut. Maybe a little bit, in the case where the best offer comes from a company I don't want to work for. But all offers should be reasonably competitive, so my refusal to work for company X doesn't affect the market that much. Great post Phil. I agree that the marginal win/revenue curve looks in similar order to what you have laid out. The small market curve looks a little extreme to me and it probably depends on the market. For instance if the Royals suddenly became an 85-90 win team I think you'd see a much sharper spike in revenue than your 'small market' curve projects. That's because the Royals, I think, have a higher mind share then say the Oakland A's. I guess it is all how you define market size. The second point worth making is that this analysis presents a single year view. But teams think over longer time horizons and make certain decisions today in expectation (perhaps false) of being in the 85-90 win zone in 3 years time. Ask every team to project it's 3 year win number and divide by the number of teams I suspect we'll be a reasonably slug above 81. Given the above teams could make decisions which in year don't see too smart i.e., land them in the 78-84 win zone but in 2 years time will see them elevate up in the 90 win sweet spot after a couple of prospects mature. Now you could argue that when you buy FA wins immediacy is important because they are (a) expensive and (b) decline because of aging so in fact no team should be buying FA wins today because they need them 2 years down the line. And I'd agree with that point of view. But I do think that when GMs think about this they want to compete for championships. That is the objective of every ballclub right? Few teams have the overarching strategic objective of making a profit. No - they want to win. Business plans (investments in players + farm) will be built around a 3-5 year plan that requires on-going investment. Obviously from a revenue perspective is better to go from a 72 win team to a 90 win team in a season but often, in an attempt, to get to 90 wins many teams will end up stuck in the mid 80s either because they misjudged talent or were unlucky. That all sounds reasonable. Maybe for a small-market team, the peak is higher but so is the trough. As I said, you'd have to do some work to figure out what the "real" curve might look like. I think that maybe teams want to compete for championships the way people want to own a Porsche ... they want to be in the *position where they can financially afford* to win championships first. I bet there are a lot of teams that think a championship would be wonderful, but money is tight and the owner won't tolerate a huge loss, so let's buy 75 wins and hope to get lucky with some prospects and maybe make a run for the wild card. It occurs to me that it's also true that revenue depends not only on wins, but on change in wins. A team that goes 69-92 every year might get a huge revenue jump if it goes 80-82 the next year. 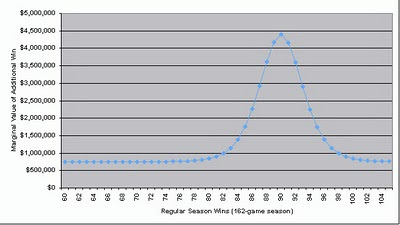 As John suggests, a three-year plan to move from 65 wins to 73 - 80 - 88 might mean a lot more revenue than the curve shows. How does an average team purchase 46 free-agent wins when the open market value of a win above replacement is roughly $5 million? In fact, how does an absurdly rich team manage that? Patrick: they don't ... They get most of those 46 from slaves and arbs.